Sam O’maison has been granted the fight he has craved for years - one that will both test his abilities and could put him on the road to a world title. The Sheffield-born southpaw will try and take the IBF International super lightweight title off its Spanish champion, in his own back yard. O’maison will fly to Malaga to take on Luca Giacon, who has won 29 and lost one. All but four of Giacon’s wins have come via knockout. 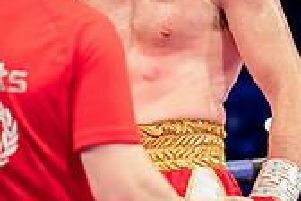 The Spaniard only won the title last month, courtesy of a fifth round stoppage. The 29-year-old will be heavy favourite, ahead of the duel on August 5. But O’maison’s trainer Ryan Rhodes believes the stacked odds will count for nothing. “Going into a fight like this, away from home, with a hostile crowd against us, may seem daunting, but we are confident. “This kid has lost once and that was in a European lightweight title fight. “When I discussed it with Sam, I mentioned the possibility of having to do extra well to persuade the judges, but he says his left and right hands will be the judge. “We think he has got the style to upset a very strong opponent” said Rhodes. A win would propel the boxer - who lives in Waverley - into the top 15 in the IBF category. Rhodes will now throw together as comprehensive a training schedule as possible in the limited time-span, including sparring sessions with Tyne and Wear boxer Lewis Ritson, who himself is preparing to face Darfield’s Robbie Barrett in a scrap for the British lightweight title in Sheffield on September 16. Rhodes, a Sheffield Wednesday fan, says O’maison, 26, will repeat the feat Sheffield United managed last Friday - winning in Malaga.